It was only recent that the Prime Minister of Japan visited Pearl Harbor,US. He was the first Japanese PM while in office to do so.He was reciprocating such a gesture by US President,again a first one while in office who visited Hiroshima,Japan in May last year.Both acknowledged the sufferings of the victims of both places and their relatives but-it was specifically reported- both stopped short of apology!They might have their own reasons for that.While attack on Pearl Harbor acted as a catalyst to escalate the II world war scene to terrible heights thereafter,dropping of atomic bombs for the first time and last time(so far) at Hiroshima and Nagasaki ended the war. 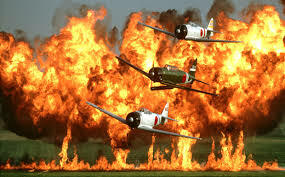 Whenever I read or hear about Pearl Harbor attack,what invariably comes to my mind is 'Tora,Tora,Tora' the English movie which was produced in 1970.I might have seen it in 1972 for the first time.The movie impressed me so much that the scenes come to my mind whenever I read about Pearl harbor! The Japs had believed that the only way to achieve successful result of attack on Pearl Harbor was to take the enemy by surprise.This was a big risk but Japan took it that way.When the lead pilot of the first wave of Japanese fighter planes was able to cover the desired distance- thousands of miles- unnoticed by the radars of US,he communicated in excitement to his commanding officer who was following in an aircraft carrier "Tora! Tora! Tora!" Tora means Tiger in Japanese.But in this context Tora is the abbreviated radio code word for 'TOtsugeki RAigeki' literally meaning in Japanese "Lightning Attack". We all know that eventually the Japs had to pay a very, very heavy price for this attack! Total surprise.....devastating barrage in history.. In September 1940 Japan signed alliance with Germany and Italy, known as Axis forces.US was not in direct war but was helping few countries of Allies forces.Axis forces expected US to enter the war sooner or later.Moreover relationship between US and Japan was getting strained day by day.Japan decided to prepare for a preemptive strike on US Pacific fleet anchored at Pearl Harbor,near Honolulu,Hawaii.Japanese war veterans believed that annihilation of the US fleet is the way to control Pacific Ocean.They planned the attack for months,kept it as top secret since they knew that they cant match the strength of US Navy unless it is done as a total surprise! Finally Japs decided the date of attack.December 7, 1941.They chose a Sunday, that too at 8.00 AM! Anyone who lives in US or west knows how quiet the Sunday morning could be! The result is that Japan could achieve the complete surprise element successfully. US forces lost 20 naval vessels,many large battleships included.All of them were destroyed or capsized.The anchored ships were perfect 'sitting ducks' for the Jap bombers.300 US aeroplanes were completely destroyed, 2000 soldiers lost their lives while 1000 were wounded, all they could inflict on the enemy in just 2 hours!! US President announced to the people that"It was a day of Infamy".I think thereafter only such a day for US in later years was on September 11,2001 when they lost twin towers of world trade center and related losses. As expected by the people, America declared war on Japan within next 24 hours.Germany and Italy declared war on America within next 2 days which was reciprocated immediately. The war was on full fledged way thereafter. Tora! Tora! Tora! remains one of the best movies I have seen related to the second world war.It was very well pictured,shot at locales of US as well as Japan and produced by 20th Century Fox, directed by Richard Fleischer, an Academy winner who has produced a host of other movies. The film if seen in 70 mm with stereo sound system will make one enjoy it anytime-even today.It was released in US and Japan simultaneously in 1970.It was more of a hit in Japan than US! Pearl Harbor also brings a lot of nostalgic moments of my home town. Kochi was always gifted with a lot of modern movie houses.If it is the time of world class multiplexes now, it was fully air conditioned theaters earlier since the first one in that class named "Sridhar" opened as early as in 1964! This particular movie house used to show only Hollywood movies, that too the best and popular ones.It was an haunting place for me and my friends then.Few years later the same management opened another one named "Shenoys" which had a 70 mm vistarama screen with special sound system I remember.This is where I have seen Tora! Tora! Tora! for the first time.Seeing a lot of classic movies those days- in my early twenties- had a terrific effect on me. I wanted to read the original books the movies were based on. Pai and Co for new paperbacks and Public Library became equally attractive destinations for me! Reading became a part of life thereafter but only after I came out of campus! Courtesy: photos to the movie.